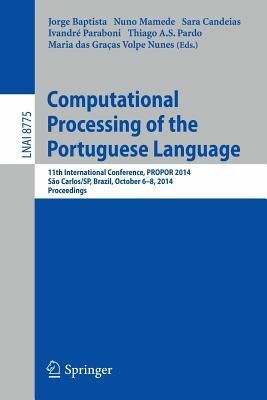 This book constitutes the refereed proceedings of the 11th International Workshop on Computational Processing of the Portuguese Language, PROPOR 2014, held in Sao Carlos, Brazil, in October 2014. The 14 full papers and 19 short papers presented in this volume were carefully reviewed and selected from 63 submissions. The papers are organized in topical sections named: speech language processing and applications; linguistic description, syntax and parsing; ontologies, semantics and lexicography; corpora and language resources and natural language processing, tools and applications.